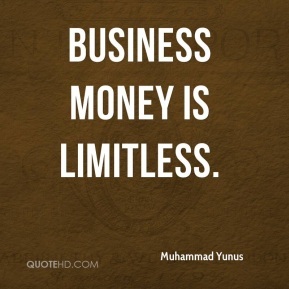 Soon we saw that money going to women brought much more benefit to the family than money going to the men. So we changed our policy and gave a high priority to women. 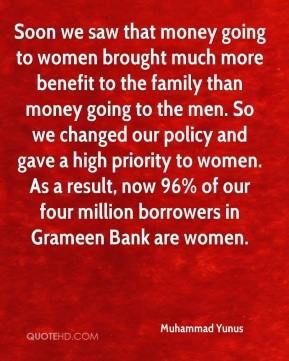 As a result, now 96% of our four million borrowers in Grameen Bank are women. There are cultural issues everywhere - in Bangladesh, Latin America, Africa, wherever you go. 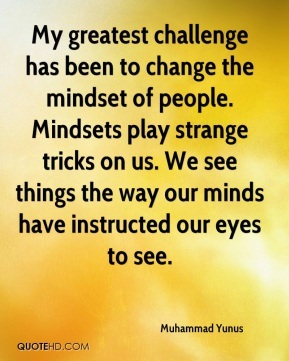 But somehow when we talk about cultural differences, we magnify those differences. 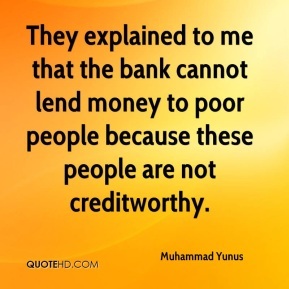 They explained to me that the bank cannot lend money to poor people because these people are not creditworthy. 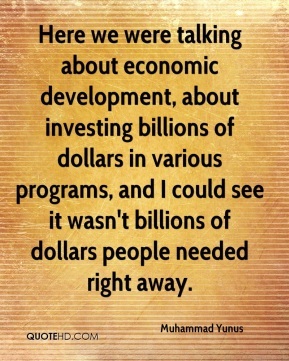 Here we were talking about economic development, about investing billions of dollars in various programs, and I could see it wasn't billions of dollars people needed right away. 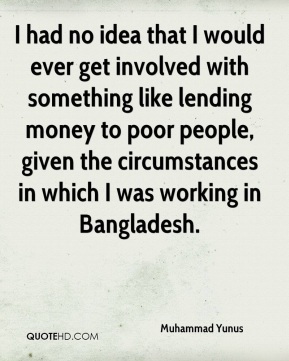 I had no idea that I would ever get involved with something like lending money to poor people, given the circumstances in which I was working in Bangladesh. 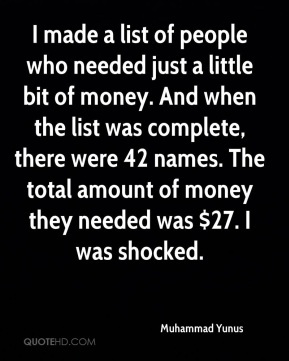 I made a list of people who needed just a little bit of money. And when the list was complete, there were 42 names. The total amount of money they needed was $27. I was shocked. 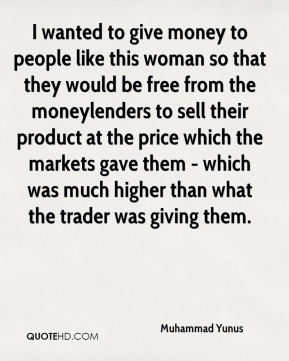 I wanted to give money to people like this woman so that they would be free from the moneylenders to sell their product at the price which the markets gave them - which was much higher than what the trader was giving them. 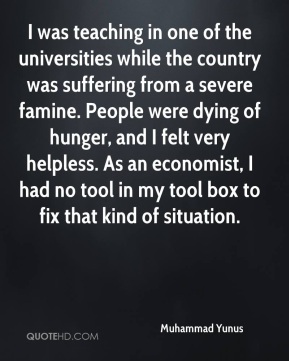 I was teaching in one of the universities while the country was suffering from a severe famine. 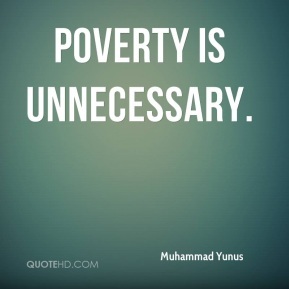 People were dying of hunger, and I felt very helpless. 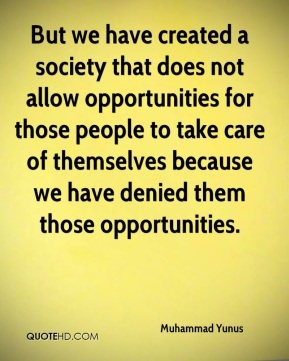 As an economist, I had no tool in my tool box to fix that kind of situation. 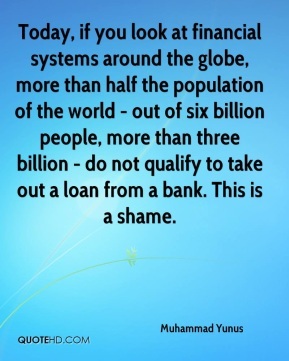 I went to the bank and proposed that they lend money to the poor people. 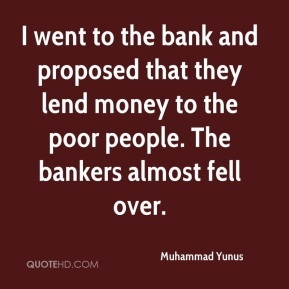 The bankers almost fell over.